Drinking beetroot juice after exercise reduces muscle soreness and helps your muscles recover according to new research from Northumbria University, published in this month’s European Journal of Applied Physiology (EJAP). The authors suggested that the nitrates and betalains in beetroot juice, which have been shown to act as antioxidants, might have aided exercise recovery by preserving muscle function and reducing inflammation. The research team led by Tom Clifford at Northumbria University’s Department of Sport, Exercise and Rehabilitation, recruited thirty men between 18 and 28 years old who exercised at least twice a week. In double-blind independent tests, each participant performed 100 drop jumps to induce muscle damage in the legs, and over the next three days completed a range of tests to assess their recovery whilst consuming either a beetroot drink or a placebo. Following the drop jumps, participants drank one of the three different drinks at specified intervals for three days; 250 ml of beetroot juice; 125 ml of beetroot juice (made up to a 250ml volume with water) or a placebo drink which was matched for calorific and carbohydrate content with the beetroot juice. The study measured soreness in both the thigh and calf muscles in active people, rather than in elite athletes, so this new research may be of more interest to real-world people. What’s more, these muscle groups are not only in use with counter movement jumps and drop jumps, but are used in running, cycling and walking. So people who suffer sore muscles after such activities could benefit from consuming beetroot or its juice. It’s also thought that the mechanism that helped the thigh and calf muscles recover faster with beetroot is not specific to the muscle groups studied, but in fact that this mechanism could apply to other muscle groups left sore after exercise. Tom Clifford adds: ‘These findings suggest that beetroot juice may protect against the negative effects of exercise induced muscle damage. Beetroot juice could therefore be beneficial for people undertaking a new exercise regime, who are more susceptible to muscle damage, or for people who already perform regular exercise, and may therefore have limited time to recover between sessions’. Different colours in fruit and veg signify different nutrients, so ‘eat the rainbow’ with this fresh, colourful salad for a healthy boost to your daily nutrient intake. Full of flavour thanks to the infused beetroot and with added crunch from the peppery radishes and peppers and mange tout, this salad is delicious served with smoked salmon. 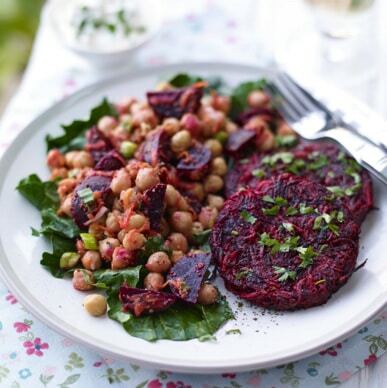 A tasty and quick to prepare lunch, with beetroot and brie. Featuring baby kale, the new baby leaf tipped to be a big hit this summer, this tasty salad packs a real flavour punch thanks to the infused Honey & Ginger Infused Beetroot. Enjoy on it’s own as a light lunch, or serve with veggie burgers fresh off the BBQ for a simple summer supper.